With the release of Macromedia Flash 8, Flash is now the most powerful and widely used client software for the web, and it's the only one that runs on virtually every browser, on every platform. 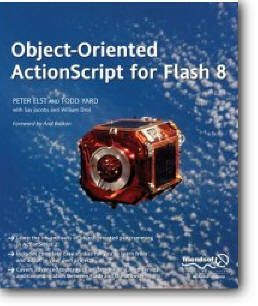 It also features ActionScript, a scripting language with great object-oriented support. As such, Flash is the ideal platform for producing sophisticated object-oriented web applications. Complex applications demand a solid understanding of object-oriented programming (OOP) techniques, regardless of the language and platform used, and this book will provide all you need. Object-Oriented ActionScript For Flash 8 teaches the theory and practice of OOP with ActionScript. You do not need any extensive prior programming experience, you just need to want to go beyond the usual Flash interfaces. Authors, and working Flash developers, Peter Elst and Todd Yard take you through the complete development cycle of a series of related applications, using numerous step-by-step instructions. You'll be able to develop highly reusable applications and services that leverage the dynamic features in Flash. This book demonstrates professional OOP skills and techniques that are completely transferable to other programming languages and technologies, including Inheritance, Polymorphism, managing classes, component development, consuming web services, and much more. It also includes some cutting edge ActionScript programming techniques, and animation and effects classes.